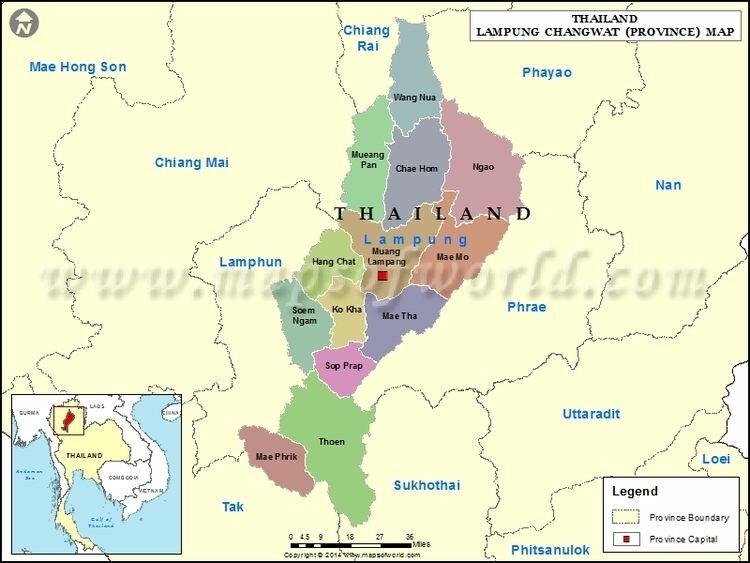 Lamphun (Thai: , ) is one of the northern provinces (changwat) of Thailand. Neighboring provinces are (from north clockwise) Chiang Mai, Lampang, and Tak. Under its old name of Haripunchai, Lamphun was the northernmost city of the Mon kingdom of the Dvaravati period, and also the last to fall to the Thai. In the late-12th century it came under siege from the Khmer, but did not fall. However, in 1281 King Mengrai of Lanna finally seized the city, and made it part of his kingdom. 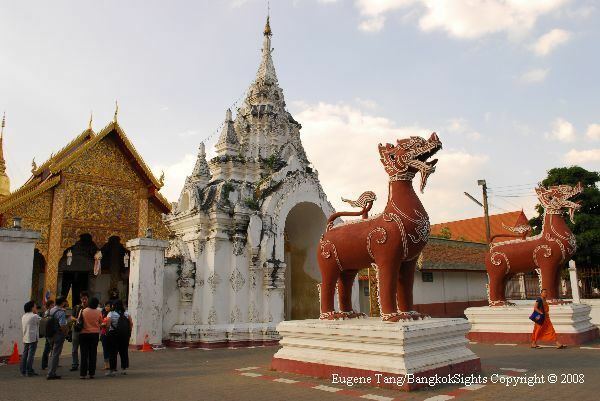 After Burmese expansion in the 16th century, Lamphun was under Burmese rule for two centuries. In the 18th century, with the rise of Thonburi and Bangkok against Burmese rule, local leaders from Lampang agreed to be their allies. Lamphun was finally freed from the Burmese and ruled by relatives of Lampangs leader, gaining vassal status from Bangkok. Eventually, after the administrative reform of Bangkok government in the late-19th century, Lamphun became part, as a province, of Siam. Wat Phra That Hariphunchai (???????????????????) 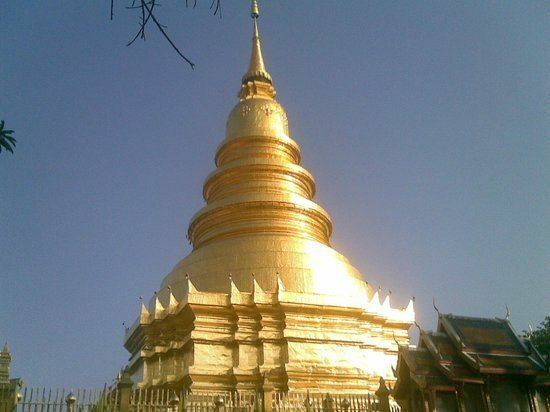 A principal landmark is the 46-metre tall golden chedi whose present appearance was the result of the restoration work in 1443 by a king of Chiang Mai. Other architectural works include the ancient-style brick arch adorned with fine designs and the pair of sculptured lions at the door. Hariphunchai National Museum (?????????????????????????????? ), across the road from Wat Phra That Hariphunchai. Displays and exhibits include historical development and archaeological items found in Lamphun. Another displays ancient utensils, Lanna indigenous arts, and carvings. Phra Nang Chamthewi Statue (???????????????????????) is in Nong Dok public park in town commemorating the first ruler of Hariphunchai. Suthewa Ruesi Statue (???????????????????) - Legend has it that the Rusi, or ascetic, was the actual founder of Hariphunchai. As an ascetic refraining from worldly affairs he invited Phra Nang Chamthevi, a daughter of the King of Lopburi, to ascend the throne and helped her to firmly establish Buddhism in the land. Wat Chamthewi or Wat Ku Kut (?????????? ???? ????????? ), commonly referred to a Ku Kut (?????? ), built in the Lawo (Lopburi) style. The chedi is a square structure similar to Buddhagaya in India. Ashes of the queen are enshrined within the chedi. Wat Mahawan (????????? ), an old temple built in the times of Queen Chamthewi. Enshrined here is a Nak Prok statue (statue with mythical serpents overhead) which was brought to the temple by the queen. Commonly known as Phra Rot Lamphun (??????????? ), it serves as the model for the famous votive tablet. Wat Phra Yuen (????????? ), an old temple from 11th century about 1 km east of the old town centre. The huge chedi with a large square base and four tall standing Buddha images dates from the beginning of 20th century. The Ku Chang-Ku Mah Chedi (???????-?????? ), northeast of the old town, is surrounded on four directions by standing statues. The chedi itself is cylinder-shaped and commemorates Queen Chamthewis war elephant and her sons steed. The Ban Nong Chang Khun (???????????????) is the most famous longan growing area in the country. The fruits are in season during July–August. Longans were introduced to the area during the reign of King Rama V and have since spread into neighbouring provinces. Wat Phra Phutthabat Tak Pha (???????????????????) - Legend has it that the Lord Buddha once stayed here, leaving a trace of likeness of monks saffron robe and his footprint on stone ground. Ban Hong (????????) - It has several old temples built in admirable indigenous style, e.g., Wat Phra Chao Ton Luang (???????????????? ), Wat Pa Puai (?????????? ), and Wat Dong Rusi (?????????). The later two temples both maintain 100-years-old Ho Trai (scripture halls) built with wood in delicate patterns. Tham Luang Pha Wiang (?????????????? ), a cave some 15 kilometres south of the town. Inside the cavern are oddly-shaped stalactites. Wat Phra Bat Huai Tom (????????????????) is the largest temple in the district, boasting a large Lanna-style chedi and an extensive place of worship built in laterite by Karens living in the vicinity who were admirers of the highly revered Phra Kru Ba Chaiwongsa. Chedi Ha Duang (????????????). The site is believed to have been an ancient town. Mae Ping National Park (????????????????????) - Its main feature is the Ping River. The most well-known event in Lamphun is the Song Nam Phra That Hariphunchai (????????????????????????? ), which dates back to olden times. Held to celebrate the provinces principal religious site, it takes place in May. Another event is the Longan Fair (?????????????) in August which is designed to promote this hugely popular fruit. There are the beautifully decorated longan parade and longan contests. Kaeng khae, a spicy curry consisting mainly of vegetables with chicken, frog, fish or snails.